Dear friends, welcome to our site. We hope it will be useful and informative in planing possible trip for those searching professional advice and support. Our location in the center of the highest Caucasian mountain region is convenient to provide our groups services in the shortest time, for any amount of days and climbers, at any period and season. We are able to maintain prices at a minimum level that makes the rest more affordable for everyone. – Excursions and sightseeing guided trips to the gorges and valleys of North Caucasus. Number of floors – 4; Amount of places – 22;Distance to the nearest cable-ways (km) – 0,01; Rooms – Junior – 2 rooms, Lux – 2 rooms, Standard Twin – 4 rooms. The road to Elbrus region begins from the nearest airports – Mineralnye Vody or Nalchik. 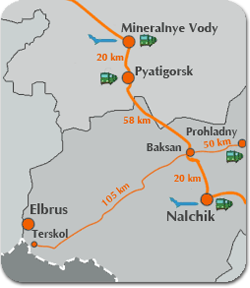 The nearest railway stations – Nalchik, Pyatigorsk, Prohladny, Mineralnye Vody. Mineralnye Vody airport in one of the biggest international airport in South of Russia, has direct flights from some foreign cities: Istanbul, Dubai, Saloniki etc. For your convenience its also possible flights to airport Krasnodar from Frankfurt and Vienna. The arrival through Moscow is the most common and on necessity we are glade to provide air tickets Moscow – Mineralnye Vody – Moscow or help to choose convenient domestic flight. There are flights almost every hour from Moscow airports, two flight to Nalchik. Which makes it possible to choose convenient flight time, connecting with international arrival without necessity to stay in Moscow. Driving time to Elbrus area takes about 2 hours from Nalchik, from Mineralnye Vody about 3 hours.